As part of Apple's new iPhone ad blitz, the company on Sunday released a 30-second spot highlighting user access to the iOS App Store and its more than 1.5 million titles, reminding consumers that "If it's not an iPhone, it's not an iPhone." Like commercials aired earlier this month, today's ad touts exclusive smartphone features, functions and user benefits only offered on Apple's in-house platform. Specifically, the spot, titled "Amazing Apps," plays up access to the iOS App Store's mammoth selection of quality software. Talking over a poppy backtrack, the narrator starts out by introducing iPhone, adding, "And it comes with something amazing: an App Store with over one and a half million of the best apps available. That's over one and a half million hand-picked, awe-inspiring, just-plain-surprising, who-knew-a-phone-could-do-that apps." From games to educational and productivity apps, a variety of titles are showcased on the screens of a seemingly endless sea of iPhones. 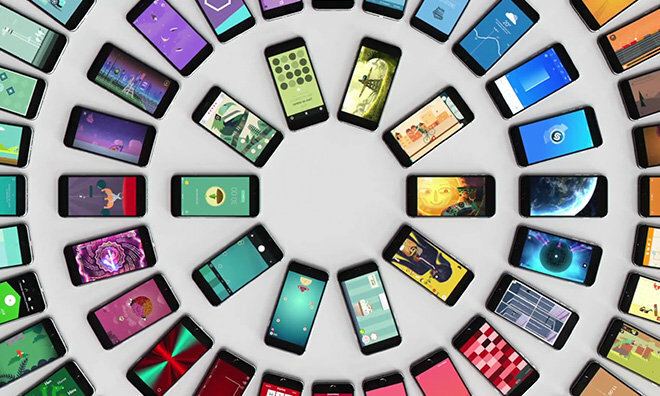 Apple's eye for detail comes through in a final visual sequence showing an iPhone kaleidoscope running apps grouped together by color. The ad ends with the tagline, "If it's not an iPhone, it's not an iPhone." Saturday's short commercial is part of Apple's "If it's not an iPhone" series that debuted with two spots advertising iPhone's cohesive hardware and software ecosystem, and wildly positive consumer satisfaction ratings. The new ads reveal a marked change in direction from previous iPhone media campaigns that relied on story-driven narrative rather than direct facts.